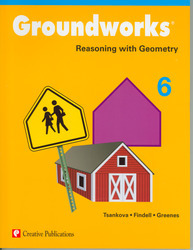 Groundworks: Reasoning with Geometry provides students with activities that investigate shapes, symmetry, congruence, angles, rotations, reflections, and more. The text provides a teaching problem for each activity set, accompanied by questions and ideas teachers can use to lead a discussion while reviewing each concept. Geometry is no longer the forgotten strand when you include this series of easy-to-use books into your lesson plans!